Last week I was asked to give a technology presentation about Hurco at a seminar hosted by WorkNC. The event was held at the Western Michigan University campus in Grand Rapids, Michigan. In addition to WorkNC and Hurco, there was one other company who was asked to present during this function...a company called Expert Tech. 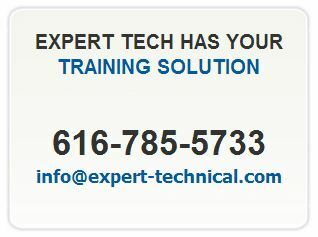 Expert Tech is a company that offers technical and employee training and development for the manufacturing industry – free of charge to the trainee - and based on some of the testimonials that I have read, are doing a fantastic job of preparing their students for a career in the world of advanced manufacturing. As I listened to the presentation, given by the company’s President, Ryan Pohl, it became very apparent that he has an obvious passion for what he does, and that recruiting, training, and preparing these candidates for a successful career in manufacturing is what he does. In an effort to provide the highest quality employees to employers, and in addition to the 200 hours of hands-on training - with classes such as: machine shop safety, communication and leadership, shop math, precision measurement, blueprint reading, die/mold classes, intro and advanced CNC milling, HSM process development – Expert Tech also pre-screens all potential candidates. These screenings include a standardized aptitude & personality assessment, criminal background check, medical physical, and a drug test. Now for the obvious question...who pays for this? Because, as we all know, nothing in life is free! The way I understand the transaction is this...Expert Tech recruits, screens, trains, and prepares the candidates free of charge to the trainee - and then schedules interviews with companies that are willing to speak to these candidates. If one of these companies decides to hire a particular candidate, then they would pay Expert Tech 50% of the cost for training that individual. If the new employee is still with the company after 60 days, then the company would pay Expert Tech the remaining 50% of the initial training cost. Since most companies incur training costs for new employees anyway - and since this process helps insure that the employers are getting pre-screened and well trained individuals - as a former shop owner myself, it seems like a win-win to me! Ryan also points out that during the training process, Expert Tech incurs the approximate 30% attrition rate that is usually attributed to hiring entry-level employees, and that the retention rate for the companies hiring these candidates is upwards of 92%...again, a win-win. Although Expert Tech is located in Michigan, Ryan says they are training candidates all over the mid-west, and the potential for online or webinar-based training allows for the possibility of long-distance training as well. He says they can also put together custom training programs for specific industries and companies as well.